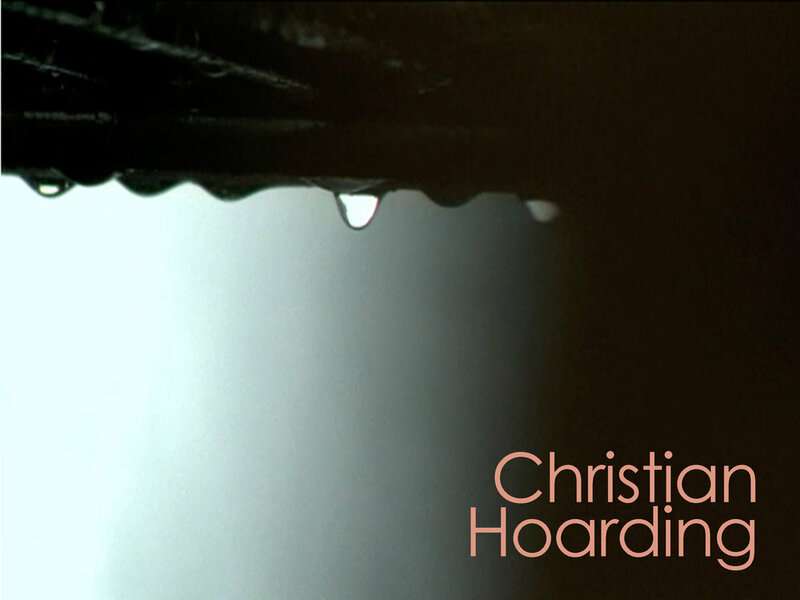 Jesus tells us to not waste our time storing up treasures on earth, but to start doing some "Christian hoarding." How many of you have ever seen a hoarding show on TV? At least two of them on now: “Hoarders” on A&E and “Hoarding: Buried Alive” on TLC. If you haven’t seen one, it’s fascinating television. Basically they go to someone’s house, and the people obviously have an addiction to hoarding. And their houses are just FULL of stuff. You can’t walk through them. I actually think their addiction is kind of heartbreaking to watch. Because the people know it’s wrong. They don’t want to live like that. But they feel like they can’t help it. Their well-being (how good they feel) is attached to having all of this stuff. We’ll kind of walk through each of those statements. In the first statement, Jesus says, don’t store up for yourself treasures on earth, but store up treasures in heaven. It’s a pretty neat statement. And I think an unbelievably important message for our culture. I mentioned this stat if you were here this winter. If you make the average per capita salary in MN, you already are richer than 96.25% of people in the world. Crazy. The reality is. We have money. Or at least you have the option to have money. Meaning: Buy another car, pay for cable, get a nicer TV (get a TV in the first place), buy clothes, buy more clothes, get a magazine subscription, see a movie. We have things we can do with our money, and as crazy as it sounds, for a good portion of the world, that’s not an option. They can only use money to pay for food for that day or for shelter. Before I go any further, let me make sure to point out that NO WHERE in the Bible does it say that money is inherently evil. It’s like we can’t help. We’re like compulsive hoarders. Not necessarily by just endlessly filling up our houses with trinkets from the Dollar General, but we have stuff, and a lot of it. But part of the problem is we don’t notice it’s normalized here. When I was a high school youth pastor, we took trips every year to Reynosa, Mexico (border town about 4 hours South of San Antonio). This winter, one of the students who was a translator for us in Mexico came up to MN for 2 weeks. When I found out he was here, I took him out to lunch. While at lunched I just asked him tons of questions about what he thought of our culture. What differences he saw. He commented on how when he got off the plane he thought might literally die because of the 4 degree weather at the time. He commented about how everyone drove so orderly. Everyone just has so much…and often there’s so much just…waste. It was fascinating to hear from him. By the way, to top our discussion off, after we ate at Jimmy John’s, I gave him the true American tour and walked him through Costco. We can’t always see it through eyes like his, but we have a lot…and Jesus says, and for what?? Because…we can get all of this stuff, a bigger house than our friends, a nicer boat, nicer clothes, a bigger TV with nicer surround sound…but ultimately for what? Seriously, for what? Does it really have an eternal value? Because someday, we’re going to have to give an account to God on judgment day of the life we lived on this earth, and you of course will be judged on if you had faith or not, but when you give an account of what you did with the gifts he gave you…what will you show him? who will never see the light of life . And he’s not saying, the more good you do, the more you get in heaven or the more stuff you get in heaven. That’s not what heaven is about: But it’s about doing stuff that will make a difference in heaven. Like, maybe considered heavenly hoarding by taking some people with you there. That’s something you can take. I can’t bring my house, I can’t bring clothes, I can’t bring my phone, I can’t bring my ipod, but…I can potentially bring my good friend who still doesn’t know Jesus Christ. That’s some good Christian hoarding right there. We ought to start praying that heaven would be “Crowded” with the people God’s put in our life. That’s some good storing up of treasure. That’s something that actually matters. Storing up treasure here on earth is just dumb investment. Why store up for, why invest in something that lasts a blink of an eye in the grand scheme of things. Start hoarding where it counts. Start storing up for where eternity happens. If God is what we really value…our time, our commitment, our money in how we help other people…it will all be reflected in that. But if our possessions, the number in our bank account is what we really value, than where we spend our time, money, and life will reflect that. Our heart is the core of our being. What we really value in our hearts drives everything we do. It’s sometimes hard to ask ourselves…what’s really in my heart? What do I really value??? But just like if you came into your normal family practice doctor, he or she doesn’t always order some sort of test to look inside of you. Often the easiest thing to do is just look at the symptoms. So start there. If someone was to come and look at your life. What you do. Where you spend your time. Where you spend your money. What would they guess is at the core of your heart? Jesus expounds on this a little in the next verses. Let’s read them again. Sometimes this eye passage seems kind of random in the midst of verses talking about possessions, money, and treasure. But it’s not random at all. Jesus says that the eye is like conduit from the world to our heart. They can’t stop endlessly running budget after budget after budget because if we don’t have enough money here the world itself could implode!!!!! Money can still have an incredible hold on your heart even if it’s not in your hands yet. So what is your eye looking at? What is your mind thinking about? And start calling yourself a liar more often. This is a healthy discipline. Because my mind lies to myself. I think, Oh, I will be so much happier when I get out of that apartment. Sure, you probably could. And those sorts of people often just end up with “just me”….alone. We believe lies about pleasure (if I had more money I would feel better and enjoy more of life’s pleasures (nicer vacations, nicer dining, nice dates, a nicer home). But the problem with all of these things is we are just trying to fulfill our needs and desires through our own provision rather than trusting in God for his security, finding worth in Him, relying on HIM, and finding joy and pleasure in HIM. And what happens is money, materials, stuff, almost becomes like a competing god in our life. The two types of hoarding treasures and the two different eyes have prepared us for this climax of the passage…verse 24. Serve to us doesn’t mean anything special. But in the original language, the term for serve is actually a word they used for a slave to serve his master. Which is quite different. Because you can serve two employers, right? You can work for Medtronic and McDonalds I guess. That wouldn’t be too complicated. Different…but not complicated. But a slave can’t have two masters. And even in some rare scenario if they did have two masters who each told them to do a different thing at the same time, they would have to pick one. Pick their loyalty. "If anyone comes to me and does not hate his father and mother, his wife and children, his brothers and sisters—yes, even his own life—he cannot be my disciple. So Jesus sort of draws the line in the sand… What side are you on? Who are you hoarding for? Your own earthly Possessions or God? Which one are you serving? Which one are you really living for? Jesus is quite frankly not interested in divided loyalties. Jesus once tells a rich man that if he wants to inherit the kingdom of heaven he has to sell all of his possession and come follow him. Meaning…for that particular individual…his money had such a blinding grip on him, that he wasn’t going to see life for what it was really about until he got rid of it. That’s not to say every rich person should sell all their stuff right now, but that is to say that, if we’re honest, often our money gets in the way. When faced with a choice, we end up serving money. We end up amassing money to make sure we can feel secure. And the list goes on. When we have it, and it’s there…so often we choose to serve MONEY rather than serve God. Some people can do otherwise. There was a family at my former church who had a very large house, and I believe it’s exactly what God wanted for them. I believe God was incredibly proud of them for building that house. Because they used it for him. All the time. Almost every month of the year they were letting people with out a space to live stay with them, they frequently would even offer battered women a place to stay. They were using wealth to make an incredible difference in this world (and the next), and it was awesome! I admire them so much. But unfortunately, for a lot of us, that kind of thing never happens. That last huge purchase we made probably isn’t going to make a big eternal difference and so on. You are either going to serve God OR serve your possessions, and if you are noticing your heart drift more and more towards your possession, the obvious yet dangerous spiritual discipline would be to start giving some of it away. Because who are you really serving? And as it amasses, if you feel its grip on you getting tighter, then loosen the grip, and start giving some of it away. OR, if you start feel YOUR own grip getting tighter on your own wallet, then realize you might already be serving the wrong of the two masters. It’s like this: Do you ever think about how the best memories you have of Christmas are of Christmas morning or Christmas Eve (whenever you open gifts) Or…even right before you open gifts. It’s kind of funny really. You’d think our best memories would be of Christmas afternoon. Or at least the evening of the 25th. When we finally started playing that brand new video game as kids, or you finally got your new Barbies out and started frolicking them around. But it’s not. Our best memories are of the expectation of memories. Because by Dec. 26th, the excitement has already started to fade. Because things on this earth just naturally get old. They rot. They rust. They expire. And they are ultimately not worth storing up. So start doing some Christian hoarding. Start filling up some space in heaven instead. Start doing things that will matter there. Because in heaven…things don’t get old. They don’t expire. They don’t rust. And the excitement never ends. That’s a worthy investment. Let’s pray.